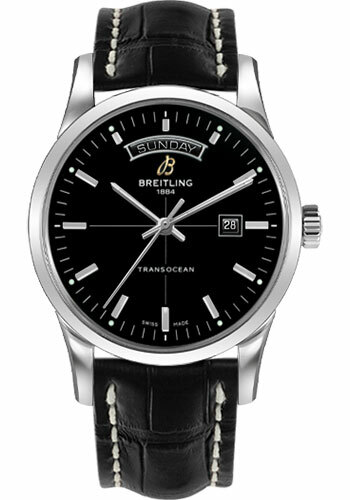 43.00 mm stainless steel case, screwed in back, non screw-locked crown with two gaskets, convex sapphire crystal with glareproof treatment on both sides, black dial, selfwinding mechanical Breitling 45 movement with date at 3 o'clock and day at 12 o'clock, approximately 42 hours of power reserve, black croco strap with deployant buckle. Water resistant to 100 m (330 ft). 43.00 mm stainless steel case, screwed in back, non screw-locked crown with two gaskets, convex sapphire crystal with glareproof treatment on both sides, black dial, selfwinding mechanical Breitling 45 movement with date at 3 o'clock and day at 12 o'clock, approximately 42 hours of power reserve, brown croco strap with deployant buckle. Water resistant to 100 m (330 ft). 43.00 mm stainless steel case, screwed in back, non screw-locked crown with two gaskets, convex sapphire crystal with glareproof treatment on both sides, black dial, selfwinding mechanical Breitling 45 movement with date at 3 o'clock and day at 12 o'clock, approximately 42 hours of power reserve, burgundy croco strap with deployant buckle. Water resistant to 100 m (330 ft). 43.00 mm stainless steel case, screwed in back, non screw-locked crown with two gaskets, convex sapphire crystal with glareproof treatment on both sides, black dial, selfwinding mechanical Breitling 45 movement with date at 3 o'clock and day at 12 o'clock, approximately 42 hours of power reserve, gold croco strap with deployant buckle. Water resistant to 100 m (330 ft). 43.00 mm stainless steel case, screwed in back, non screw-locked crown with two gaskets, convex sapphire crystal with glareproof treatment on both sides, Mercury silver dial, selfwinding mechanical Breitling 45 movement with date at 3 o'clock and day at 12 o'clock, approximately 42 hours of power reserve, black croco strap with deployant buckle. Water resistant to 100 m (330 ft). 43.00 mm stainless steel case, screwed in back, non screw-locked crown with two gaskets, convex sapphire crystal with glareproof treatment on both sides, Mercury silver dial, selfwinding mechanical Breitling 45 movement with date at 3 o'clock and day at 12 o'clock, approximately 42 hours of power reserve, burgundy croco strap with deployant buckle. Water resistant to 100 m (330 ft).